Emily Mead is a Senior Program Manager on the Urban Team at Institute for Sustainable Communities (ISC). In this role, she supports ISC’s work in Maricopa County, on the Advancing Community Resilience Partnership. This project, designed in partnership with Virginia G. Piper Charitable Trust, is intended to build community engagement, social cohesion, and resilience. Emily brings her local knowledge and strong experience in economic development, public-private partnerships, and relationship management to this place-based effort. Emily has worked in economic development, fundraising, public relations, and partnership management for a variety of organizations and projects in Maricopa County, Arizona. She acted as project manager for Velocity, a public-private initiative to accelerate the growth of Greater Phoenix, developed in partnership with the Brookings Metro Policy Project. She has extensive experience in relationship management, corporate sponsorships, and local and regional economic development initiatives. Before joining ISC, Emily was Community Engagement Director at the Greater Phoenix Economic Council (GPEC), where she managed relationships with public and private sector partners in 23 municipalities. Also at GPEC, she served as Strategic Engagement Director and Strategic Partnerships Manager, raising and retaining corporate sponsorships and organizing events, workshops and conferences for the region. Prior to GPEC, she was Manager of Fundraising and Marketing for the Southwest Center for HIV/AIDS, where she managed partnerships, events and volunteers. Emily earned a Master of Public Administration from Arizona State University and a B.S. in Advertising and Public Relations from Northern Arizona University. She holds a certificate in Strategic Management from the Thunderbird School of Global Management. She is a member of the 2017 class of the Valley Leadership Institute and chairs both the Valley of the Sun United Way’s junior board Generation United and Scottsdale Art’s AG2 Leadership Council. She is based in Phoenix. As the Director of Urban Resilience for ISC’s urban team, Steve works with other ISC staff, global thought leaders, as well as state and local leaders across the United States and in Southeast Asia to identify and catalyze break-through opportunities to advance urban sustainability and resilience. Steve also leads key components of ISC’s climate change adaptation & resilience programming to build the capacity of local leaders in addressing the impacts of global climate change. Steve has acquired a diverse technical background over more than two decades in the public and nonprofit sectors, with experience in marine fisheries, regulatory compliance and enforcement policy, sustainability indicators, and energy policy. Over the past 10 years, Steve has focused increasingly on climate change mitigation and adaptation issues at the state, regional and local level in dozens of communities across the United States. Since leaving government in 2009, Steve has led community-based and sector-based adaptation projects in the Pacific Northwest, helped catalyze the Southeast Florida Regional Climate Change Compact as a model for regional scale adaptation and co-founded the American Society of Adaptation Professionals to serve as a community of practice for practitioners working in various sub-fields of climate adaptation. From 2007-2009, Steve served as an energy and policy advisor to Florida Governor Charlie Crist and as Staff Director for the Governor’s Action Team on Energy and Climate Change. Previously, he served as the Policy Director for Florida's Department of Environmental Protection where he led agency-wide policy development on issues ranging from ocean protection to energy to information technology. In 2002-2003, he served at the U.S. EPA as Senior Advisor to Administrator Christie Todd Whitman’s Environmental Indicators Initiative. Steve holds a BA in Economics from the University of West Florida and a Master of Public Administration from the Askew School of Public Administration & Policy at the Florida State University. He is a member of the American Society of Adaptation Professionals. 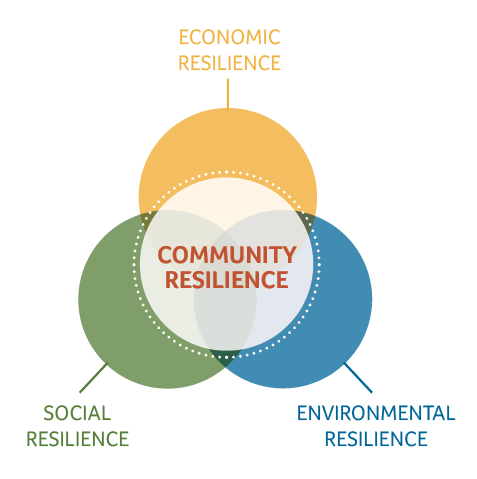 Virginia G. Piper Charitable Trust and Institute for Sustainable Communities—alongside agencies, private and social profit organizations, and individuals—are building the Advancing Community Resilience Partnership. 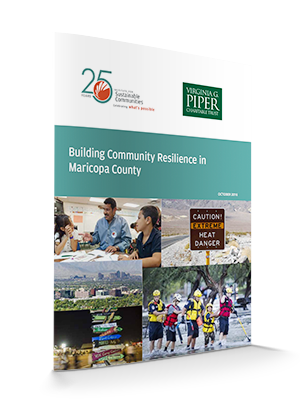 By tapping the strengths of existing relationships and fostering new collaborations, this effort works to collectively address pressing issues and community needs—ultimately helping build Maricopa County’s community resilience. Whether it’s the great recession’s disruption on Arizona’s economy, gaps in coordination among social profits, or the persistent threat of extreme heat on Phoenix residents, it’s imperative that Maricopa County communities evolve and become stronger by overcoming economic, social, and/or environmental vulnerabilities. This is community resilience. Virginia G. Piper Charitable Trust, in partnership with Institute for Sustainable Communities (ISC), convened a series of interviews, focus groups, and workshops on the topic of community resilience. The Trust wanted to learn firsthand from the community about regional efforts underway aimed at building resiliency in our nonprofit community and social sectors—our social profit sector as we like to call it. We sincerely thank the more than 200 individuals representing arts and culture, social services, healthcare, education, philanthropy, the private sector, and local and state government, for sharing perspectives, ideas, and candor; the contributions from these various dialogues are the impetus for the report Building Community Resilience in Maricopa County. Piper Trust remains dedicated to its mission—to support organizations that enrich health, well-being, and opportunity for the people of Maricopa County. In an effort to enhance our work, the Trust has engaged ISC over the next several years to help us strengthen community resilience and social cohesion through strong collaborations and our grantmaking and initiatives.